At ROYAL CANIN® we are exceptionally proud to be working alongside Guide Dogs, helping to feed its 8,000 dogs, from tiny puppies to working dogs, or even their older dogs enjoying retirement! Please click here to visit our stockist finder. Have you ever wondered what living with sight loss must look like? On 5th October, celebrities took part in an immersive sight loss race through the streets of central London whilst wearing augmented reality headsets. The headsets run an app called Eyeware, which has been developed by Transport Systems Catapult to replicate various sight loss conditions. The celebrities were tasked with navigating the busy city environment whilst experiencing the world with one of these conditions, assisted by a trained sighted guide. This video gives an impression of what they saw. The purpose of this event was to raise awareness of Guide Dogs Week which happens every year in October. 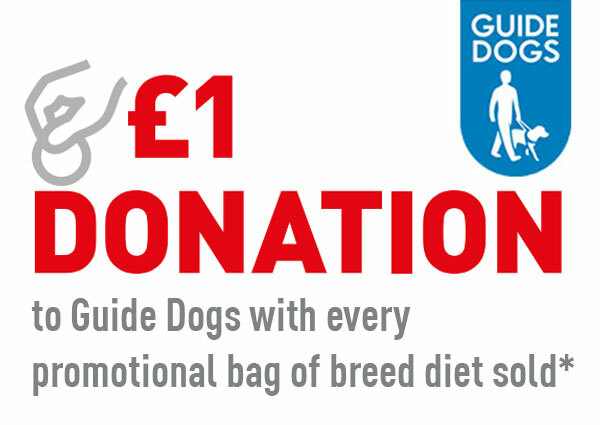 Terms & Conditions apply* £1 will be donated to Guide Dogs for the first 10,000 promotional bags of 1.5kg, 7.5kg or 12kg purchased from the ROYAL CANIN® Breed Health Nutrition range between 9th October – 29th December 2017 at participating retailers. While stocks last. ROYAL CANIN® have the right to withdraw this promotion at any time.